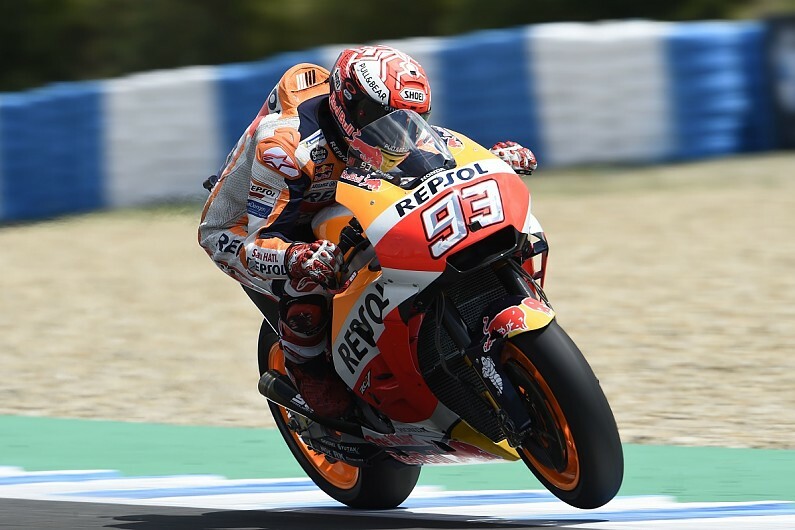 Reigning MotoGP champion Marc Marquez topped third practice ahead of the Spanish Grand Prix at Jerez, as both Andrea Dovizioso and Maverick Vinales missed out on automatic Q2 spots. Ducati's championship leader Dovizioso and Yamaha rider Vinales were outperformed by their factory team-mates in the late-session qualifying simulation runs, respectively finishing four and sixth hundredths off making it into the top 10. Having crashed late-on during Friday practice, Marquez usurped Aprilia's Aleix Espargaro for the lead in the opening stages of the 45-minute FP3 session. He then took until the 10-minute mark to pump in the fastest lap of the weekend so far, a 1m38.549s, surpassing LCR rider Cal Crutchlow's best effort from second practice. But the Honda privateer's response, arriving at the midpoint of the session, was emphatic, as he went almost six tenths clear with a 1m37.973s. With the clock running out, Marquez emerged for his first run with a new soft rear tyre, and reclaimed the top spot with a 1m37.818s, following that up with a 1m37.702s on his next lap. That time ended up coming under no threat from the soft-tyre runners, with Crutchlow and Suzuki's Andrea Iannone completing the top three, both around three tenths behind Marquez. Tech3's Johann Zarco was the top Yamaha runner in fourth, ahead of the lead Ducati of Jorge Lorenzo and Pramac's Ducati GP17 rider Jack Miller. Yamaha's Valentino Rossi, Dani Pedrosa, Danilo Petrucci and Alex Rins made up the top 10 in FP3, and in doing so booked their spots in the pole shoot-out later on Saturday. Avintia Ducati rider Tito Rabat was the only rider to crash, hitting the deck at the long Turn 5 right-hander during a soft-tyre run, before sprinting to his garage and rejoining the track - later finishing 14th place.